A Monthly Magazine Devoted to the Investigation of Supernormal Phenomena and the Study of Psychological Problems. 1/1, January 1905-58/2, August 1933; then The London Forum from September 1933 to October 1935, and then returned in 1936 to the original title, incorporating the London Forum. In 1938 it reverted to the original title, and in 1949 it became Rider's Review. An "American Edition" of the journal, differing only in those words stamped on the spine, was distributed from New York (probably from Hackensack, New Jersey by the Hermetic Research Center) from 1911 to 1925. A "Foreign Edition" was published in arrears from 1907 to 1932, beginning with vol. 5, January 1907, which reproduced vol. 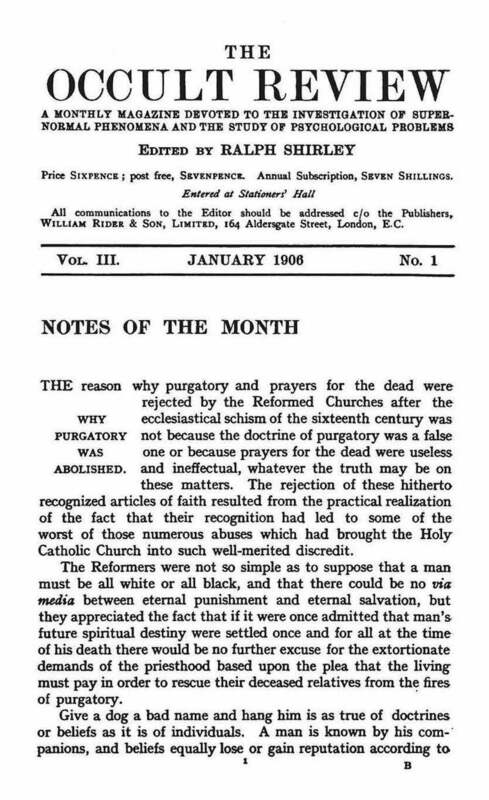 5, December 1906, of the British edition. 48 pp., 6 x 9. Seven shillings a year, sixpence a copy (sevenpence postpaid). Editions are detectable by the currency on the issue covers. This was undoubtedly the pre-eminent English-language occult journal of the first quarter of the twentieth century because of the scope and quality of its contributors: A.E. Waite, C.G. Harrison, Franz Hartmann, W. Gorn Old, Andrew Lang, E.W. Berridge, Isabelle de Steiger, Oliver Lodge, J.M. Peebles, Robert Hugh Benson, Hereward Carrington, H. Stanley Redgrove, Mabel Collins, Arthur Avalon, Algernon Blackwood, W.J. Colville, Montague Summers, Sax Rohmer, Kenneth Sylvan Guthrie, Theodore Besterman, and many others. The journal carried articles and reviews, both antiquarian and (occasionally) practical but rarely dogmatic, on every possible occult and spiritualist topic, including ones on John Dee, vampirism, scrying, Sri Agamya Guru Paramahamza (who has an indirect influence on the beginnings of the O.T.O., the Ordo Templi Orientis), "Mr. Isaacs of Simla," J.M. Peebles (his very curious Spirit Mates), Bram Stoker, Aleister Crowley, Victor Neuberg, and many more, all written in the literate and dry style of the era. Of one of R.S. Clymer's works, for example, a reviewer noted that "on careful consideration one feels inclined to say that what is true in it is not new, and what is new is not true." Shirley not only edited the Occult Review but was also the owner of Rider & Co., and was thus a pivotal figure in occult publishing. As "Rollo Ireton," he had earlier published The Horoscope. NYPL; LOC; BNF; ZDB: Freiburg Inst Grenzgeb Psychol; Frankfurt/M UB. The differences in content between the two editions for any given issue are not necessarily documented. Indices are available for the domestic/UKM.a and foreign editions. An index of the periodical's articles between 1905 and 1948 is available.